This is the first of what should become a series of issues of “The Live Bait Squadron“ Bulletins, intended for members of the Society to be set up. By means of these bulletins I intend to keep alive the memories of the crew of the three ill-fated cruisers. The idea is to go on with the Society and the publication of Bulletins at least till the 1914 Centennial. This first Bulletin is mainly devoted to the stories that were told at St George’s in Chatham during the assembly on 22 September last. That, however, wasn’t the only memorable occasion that took place that day. Earlier on, an imposing “Turning the Page Service” was held at Rochester Cathedral. So many people assisted in making these events successful that it would be impossible for me to say thank you to everyone separately, as I would surely risk to miss out one or more names. So now I confine myself to expressly thank Miss C. Mann (Cecilia) who played such a crucial role in making the happening at the Cathedral successful. Many of you attended the afternoon’s meeting at St. George’s Centre. I really enjoyed it and I am grateful to everyone who participated, as I said in my speech. Though for the same reasons as quoted above I can’t possible mention everyone by name, I would like to make an exception here for the Mayor of The Hague’s personal representative, Mr Thijs Van Leeuwen. At the meeting, the “Documentary Team” gave us a foretaste of what their documentary will look like. And then came the stories about the ancestors. In this issue you will find a few photographs that were taken that afternoon of some of the speakers. As Prof Eric Grove and Peter Dawson did not write out their speeches we will have to content ourselves with their pictures only. But I’m happy to be able to send copies herewith of the stories told by a number of the descendants. After Saturday’s fine and rewarding events my wife Toos and I, together with a few relatives and the Documentary team (Klaudie Bartelink, Annet van Aarsen and Lotte Kauffman) set out for Dartmouth early Sunday morning. 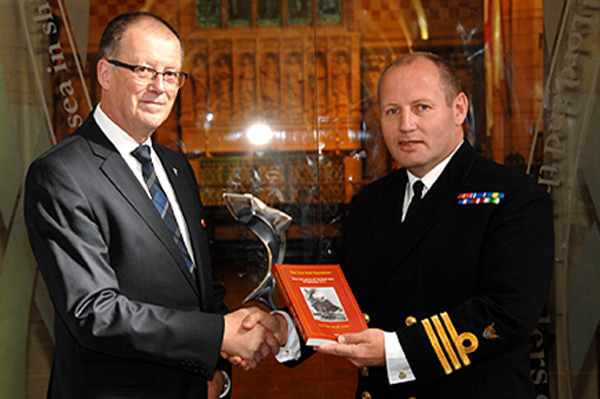 On Monday we had the privilege of presenting the book to Britannia Royal Navy College’s Commander Jason Phillips. I feel fortunate that the College’s two historians (BRNC’s Archivists and Museum Curators Dr Richard Porter and Dr Jane Harrold) have been kind enough to advise and assist me for many years, throughout the process of researching and writing the book. Their help has been invaluable. A new book telling the story of three ships lost in the First World War, with 13 Officer Cadets mobilised from Britannia Royal Naval College (BRNC) on board, has been presented to the College. The book entitled ‘The Live Bait Squadron’ was written by Dutch historian, Henk van der Linden, and focuses on the battle cruisers HMS Cressy, HMS Aboukir and HMS Hogue. The ships were tasked with the perilous job of patrolling the waters around Britain during the war. On 22 September 1914, the cruisers operating in the North Sea, just off the Dutch coast, were sunk in one of the first clashes with a German U boat. The encounter, which lasted just over one hour, took the lives of approximately 1,500 sailors. During his visit Mr van der Linden was accompanied by a documentary-maker and filmed aspects of the College for a 50 min programme being made on the tragedy. They were particularly interested in the commemorative plaque in the College Chapel to 15-year-old Midshipman H L Riley, one of the 13 cadets mobilised from the College in August 1914, who died in the attack. Now this will be all for our first issue. Till the next Bulletin, kind regards, Henk.